Rosa Hilfe Wuerzburg – 19446 – talking helps!! 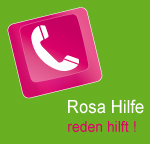 Rosa Hilfe is a Germany-wide brand name for qualified advice on gay issues by gay men. Rosa Hilfen can be reached via the unified telephone number 19446 with the respective area code. We, the ROSA HILFE Würzburg, have formed a consulting team under the umbrella of the WuF gay centre in Würzburg. We are men of different ages (mid 20 to mid 60s) and professions. Some of us have a psychological or socio-pedagogical education, others do not. We all regularly take part in training and further education measures to conduct conversations and provide advice. We are supported by our WuF-Zentrum and the city of Würzburg, to whose Aktivbuero we are connected.